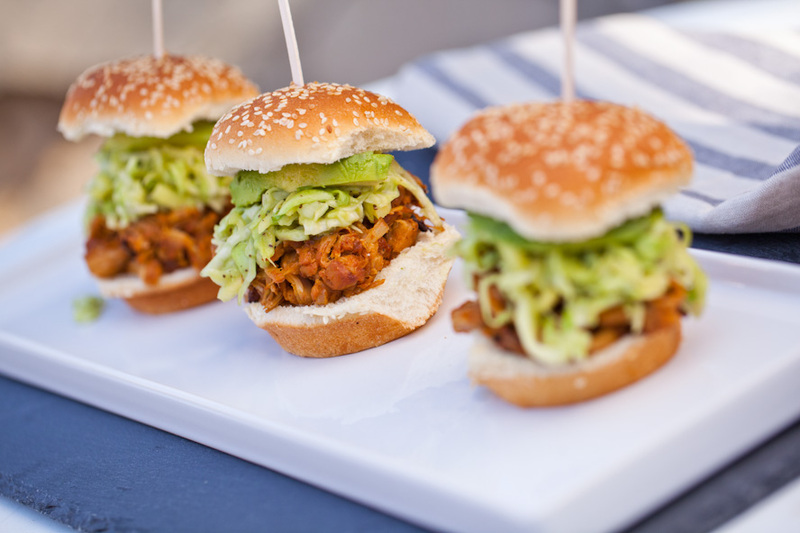 I want to celebrate these Carolina-Style BBQ Jackfruit Sliders! They the final recipe of our Kickstarter series, in which our super amazing backers got to choose a recipe for us to veganize. That is cause for celebration for sure! But more importantly, these Carolina-Style BBQ Jackfruit Sliders are for everyone out there who loves vegan BBQ but wants a variation from the traditional tomato-based BBQ sauce that’s commonly in vegan recipes. I mean, I get it. Vegan BBQ is magical and delicious, and we super love tomato-based sauce. (We recently made BBQ Pulled Jackfruit Sandwiches with traditional sauce! So good!) But just because you’re a vegan doesn’t mean you should ever be deprived of your favorite foods. And if you’re favorite food involves spicy, mustard-y BBQ, well then we have got you covered. If you’ve never tried jackfruit before, you are missing out! It’s large spiny fruit that’s native to South Asia. We’ve never worked with fresh jackfruit before, but the canned variety (in brine or in water) works tremendously well as a meat substitute. We buy ours from the local Indian market, and many Asian markets carry it as well. Spicy, delicious Carolina-Style BBQ Jackfruit Sliders. Hearty, meaty vegan sliders topped with avocado and sweet apple slaw, the perfect compliment to the vinegar based sauce! Preheat the oven to 400. Open and drain the cans of jackfruit. Trim the tough core from the jackfruit pieces and remove the seeds. Cut the jackfruit into very small triangle shapes. This will help the jackfruit get the stringy, pulled texture. In a large skillet, heat the oil on medium high. Sauté the onion for 1-2 minutes until it becomes slightly translucent. Add the garlic and cook for another minute or two. Stir in the jackfruit, then add the vinegar, brown sugar, worcestershire, liquid smoke, and dry spices. Mix well. Pour the vegetable broth into the skillet, reduce heat to medium, and cover. Cook the jackfruit until all the liquid is absorbed, about 10 minutes, stirring often and mashing the jackfruit pieces until the mixture becomes stringy and resembles pulled pork. On a lined or greased baking sheet, spread the jackfruit in an even layer. Bake in the oven for 20 minutes, then take the pan out and pour the Carolina-style BBQ sauce over the jackfruit. Stir well until evenly combined and if desired, use a fork to shred the bbq pulled jackfruit even further. The smaller the pieces are, the chewier and more delicious they will be. Place the pan back in the oven for another 20 minutes and get to work on the avocado slaw. (Recipe below) Assemble the sliders with a scoop of Carolina-style BBQ Pulled Jackfruit, apple slaw, and a drizzle of sauce. This recipe makes 8 sliders, with leftover slaw. Apple Slaw- Peel the apples and julienne the apple into matchstick sized pieces. In a medium bowl, mash one large avocado. Set the other aside to top the sliders. Add the apple matchsticks and remaining ingredients to the mashed avocado. Stir to combine. Did you try these Carolina-Style BBQ Jackfruit Sliders? Leave us a comment and tell us how they turned out! Or post a photo of your sliders to Instagram with the tag #carrotsandflowers 🙂 We love seeing your creations!! If you haven’t tried the recipe for Carolina-Style BBQ Jackfruit Sliders but want to save it for later, pin the photo below! If you enjoyed these Carolina-Style BBQ Jackfruit Sliders, check out our Smoky Portobello Black Bean Burgers or our Chickpea Salad Sandwiches! I made this today and we loved it but there is nothing in the ingredient list for the Worcestershire or liquid smoke.